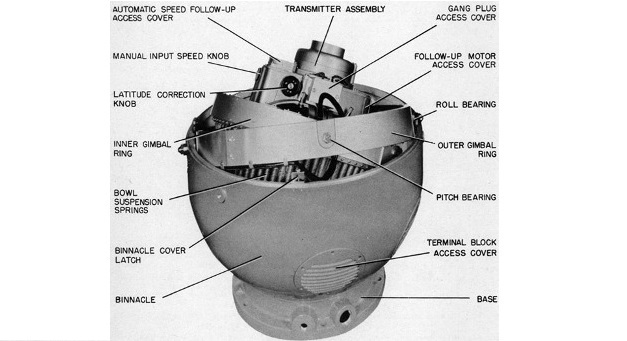 A marine gyro compass assembly is a modern gyroscope designed to automatically find geographical directions. 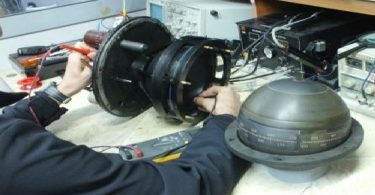 Although gyroscope is one important component of a gyro compass, these are not the same devices; a gyro compass is built to use the effect of gyroscopic precession, which is a distinctive aspect of the general gyroscopic effect. 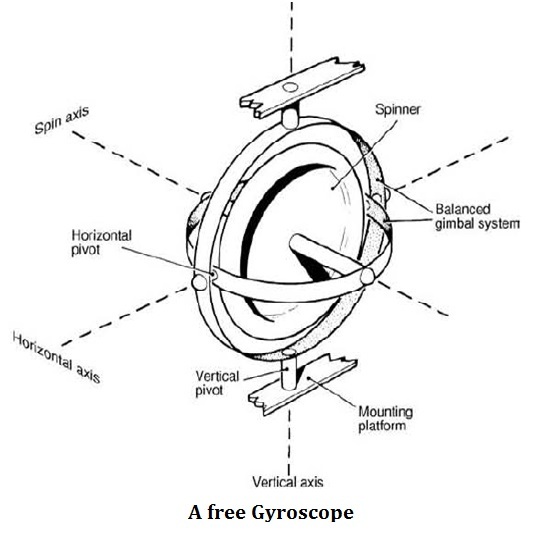 Gyroscope consists of a perfectly balanced wheel arranged to spin symmetrically at high speed about an axis or axle. The wheel, or rotor, spins about its own axis and, by suspending the mass in a precisely designed gimbals assembly, the unit is free to move in two planes each at right angles to the plane of spin. There are therefore three axes in which the gyroscope is free to move. A gyroscope rotor maintains the direction of its plane of rotation unless an external force of sufficient amplitude to overcome inertia is applied to alter that direction. What are factors on which gyroscopic inertia depend? The total mass, M of the rotor (for all particles). The radius r summed as the constant K (for all the particles) where K is the radius of gyration. A free gyroscope suffers an apparent movement in both azimuth and tilt of the rotor axis depending upon its latitudinal location. When fitted to a vessel the latitude is known and consequently the extent of movement in azimuth and tilt is also known. It is possible therefore to calculate the necessary force required to produce a reciprocal action to correct the effect of apparent movement. 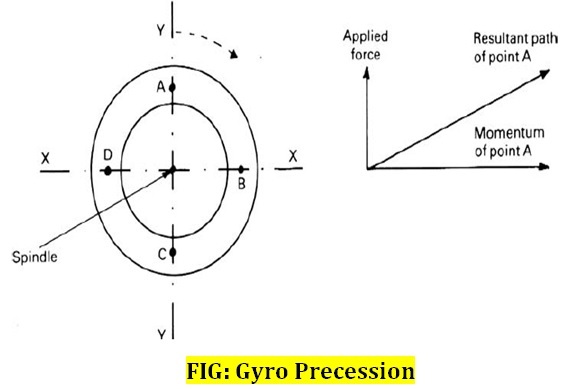 A force can be applied to the gyro that will cause both azimuth and tilt precession to occur in opposition to the unwanted force caused by the gyro’s position on the earth. If the gyro is drifting in azimuth at ‘D’ degrees per hour in an anticlockwise direction, an upward force sufficient to cause clockwise precession at a rate of ‘–D’ degrees per hour must be applied vertically to the appropriate end of the rotor axle. The result will be that the gyro drift is cancelled and the instrument points to a fixed point on earth. Gyro tilt movement can also be cancelled in a similar way by applying an equal and opposite force horizontally to the appropriate end of the rotor axle. How to make gyro north seeking? The gyrospin axis can be made meridian-seeking (maintaining the spin axis parallel to the earth’s spin axis) by the use of a pendulum acting under the influence of earth gravity. The pendulum causes a force to act upon the gyro assembly causing it to precess. Precession, the second fundamental property of a gyroscope, enables the instrument to become north-seeking. As the pendulum swings towards the centre of gravity, a downward force is applied to the wheel axle, which causes horizontal precession to occur. This gravitational force acting downward on the spinner axle causes the compass to precess horizontally and maintain the axle pointing towards true north. The two main ways of achieving precessional action due to gravity are to make the gyro spin axis either bottom or top heavy. Bottom-heavy control and a clockwise rotating gyro spinner are used by some manufacturers, whereas others favour a Top-heavy control system with an anticlockwise rotating spinner. What are advantages and disadvantages of Gyro Compass? Where Gyro Compass should be placed / kept onboard? What are Operational checks in gyro Compass? What are Alarms in gyro compass? How to start and stop gyro compass? How does the new MLC (maritime labour convention) make it easier for countries to ratify it and to implement its requirements? Graduated from M.E.R.I. Mumbai (Mumbai University), After a brief sailing founded this website with the idea to bring the maritime education online which must be free and available for all at all times and to find basic solutions that are of extreme importance to a seafarer by our innovative ideas.